In November 2012, the WHO Collaborating Centre research team and Director, Professor Salman Rawaf, undertook a 2-week WHO assignment to assess the post-conflict health system in Libya. 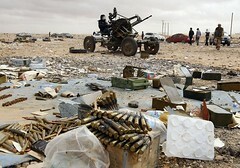 Is this what is called peaceful Libya? The WHO Collaborating Centre was requested to carry out an in-depth assessment of Libya’s health system with focus on key system functions to be followed by the production of a road map for a better operating, efficient post-conflict version of that Health system. The assessment involved an in-depth a desk review; field visit; and interview with key informants, and resulted in the production in 2 reports. The assignment took 3 months to complete; including a 11 day visit to Tripoli by Salman Rawaf, Elizabeth Dubois & Sondus Hassounah (WHOCC ICL), Mohamed Abdel Aziz (El-Zanaaty Egypt), Ibrahim Beit ElMal (WHO-Libya) . Posted on 18th December 2013 by newsafrica. This entry was posted in Africa, Headlines, Libya. Bookmark the permalink.